A business organization managed by the best personnel is bound to survive all challenges and remain relevant in an emerging and vibrant Nigerian economy. We at Patfam Investment Limited have taken up the challenge to fill the vacuum by providing the highest professional Human Resource services to enable our local and foreign clients maintain a competitive business edge. We are a focused HR firm with the objective to grow together with our clients by striving to proffer the best human resource solutions to enable them optimize their full potentials. Hospitality Industry (Hotels, Restaurant, and Lodge etc) is the youngest and fastest growing business in the Nigeria and indeed worldwide; these industries are fast growing but are operating in a rapidly changing business environment. Let’s do staff background Checks for you. 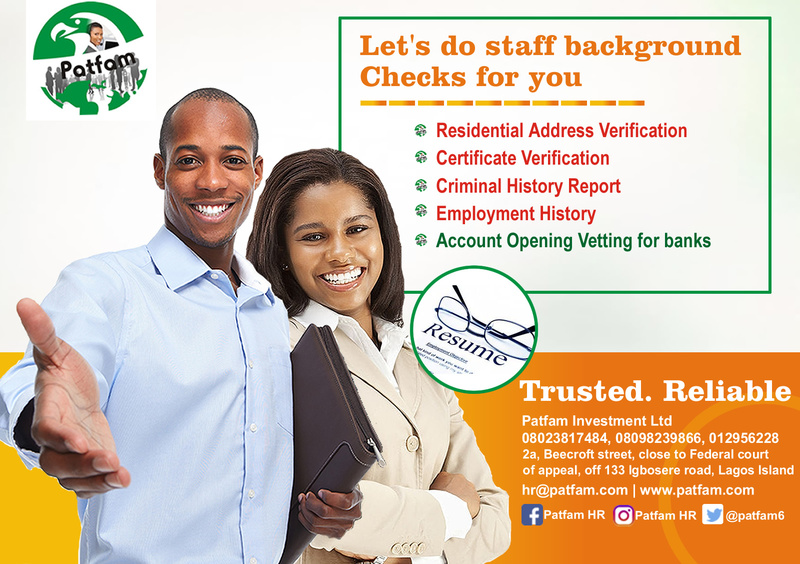 Patfam HR offer professional services in Residential Address Verification, Certificate Verification, Criminal History Report, Employment History, Account Opening Vetting. Call 08023817484, 08098239866.